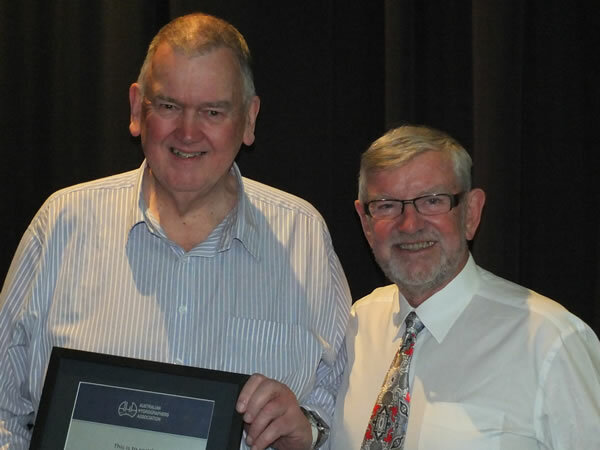 Peter Heweston was inducted as a Fellow of the Australian Hydrographers Association with Life Membership on Tuesday 13 November 2018. From 1968 to 1969 Peter worked as a Trainee Programmer and Programmer with the Prospect County Council in Parramatta. From 1969 to 1972 Peter held various positions as a Technical Assistant, Technical Officer and Experimental Officer with the CSIRO Division of Land Research. The work involved the maintenance and further development of the EDTRACE system for storage and retrieval of time series data. EDTRACE was developed by CSIRO, and was one of the earliest systems designed specifically to handle time-series environment data. In 1973 he joined the National Capital Development Commission where he was responsible for all external computing and during this time he further developed the EDTRACE system using it to store and retrieve traffic flow data recorded on a variety of recorders and loggers. In October 1984 Peter formed Peter Heweston and Associates, and set up business as a computer consultant, working primarily in the area of PC based systems. In 1985 Peter was commissioned to review the processing system used by the then Commonwealth Department of Housing and Construction (DH&C) where they were using EDTRACE, and processing their data using CSIRO NET. It was during this period of early HYDSYS development that Peter commenced working with Bill Steen, Trevor Magnusson and Gary Newton. Bill Steen has memories of Peter and him sitting beside each during the initial development phases of HYDSYS and Peter asking “so how do you process charts?”. After understanding the process, Peter commenced on Hycharts program, with the assistance of Bill to run Hycharts over a digitising machine. The early programs developed by Peter for Department of Housing and Construction were successful, and performed the desired functions adequately. Over the ensuing years HYDSYS developed, and became quite large. Department of Housing and Construction were proudly showing of their new system and the Australian hydrographic industry became interested. HYDSYS Pty Ltd was incorporated in 1987, and at the time HYDSYS was installed at the NSW Department of Water Resources; 1988 saw the Western Australia Water Authority sign up for HYDSYS, closely followed by Sydney Water Board. Peter and his work is well recognised as having contributed greatly to the profession of hydrography in Australia. Congratulations Peter, for your significant contribution to the profession and to the AHA and on your appointment as “Fellow of the Australian Hydrographers Association with Life Membership”.